A software to perform virtual screening using AutoDock Vina. The latest version of Java JRE (version 6) is recommended. Download it from here. Unzip the files to any directory and launch the software using "java -jar PaDEL-ADV.jar" without the double quotes. For Mac users, you can download an alternative version here (please feedback to me which version works for you so that I can modify future versions accordingly to work correctly for Mac). 1. Prepare receptor pdbqt file using AutoDockTools. 2. Prepare AutoDock Vina configuration file with at least the following information (check AutoDock Vina manual for description of these information). 3. Place all ligands files in a directory. Most common file formats (e.g. MDL mol, SMILES, PDB) and PDBQT files are supported. Run PaDEL-ADV, fill in all the fields and press the Start button. On completion, a zip file containing results and related files will be created for each ligand. The results from all the ligands will be consolidated into the specified CSV file. Note: If you are running PaDEL-ADV under Linux, you may have to open a terminal window, run "source MGLTools-$Version/bin/mglenv.sh" before launching PaDEL-ADV using "java -jar PaDEL-ADV.jar". This is to ensure that the proper environment variables are set. Otherwise, you may encounter ImportError due to python's failure to find the MGLTools packages when running the python scripts from within PaDEL-ADV. You can use PaDEL-ADV without the graphical interface. Unzip the files to any directory and run the software using "java -jar PaDEL-ADV.jar -config <config> -verbose", where <config> is the configuration file (e.g. PaDEL-ADV.ini), and -verbose will provide verbose output and is optional. The configuration file can be generated using the File->Save configuration menu. A sample of the configuration file is available for Windows and Linux. To get help for the command line, use the command "java -jar PaDEL-ADV.jar -help". 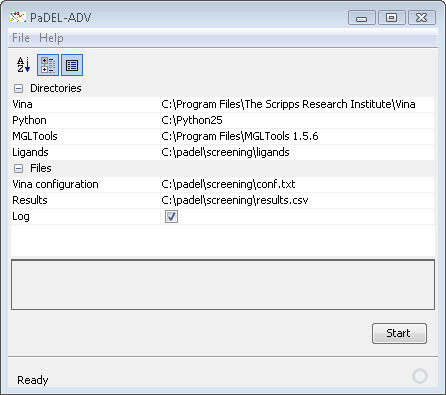 PaDEL-ADV reads a directory containing ligands files. For each ligand, the structural file is converted into a pdb file, if necessary, using The Chemistry Development Kit. The pdb file is then converted to pdbqt using the prepare_ligand4.py script provided by AutoDockTools and then converted back to pdb file using pdbqt_to_pdb.py script. This back-conversion is to faciliate RMSD calculations because the number of hydrogens atoms in the original pdb file and converted pdbqt file may not be the same. If the ligand file is already in pdbqt format, the file is used directly for docking and a pdb file is generated using the pdbqt_to_pdb.py script provided by AutoDockTools. AutoDock Vina is then used to dock the ligand with the receptor. Individual binding modes are extracted from the output pdbqt file using vina_split. The pdbqt files are then converted to pdb files using the pdbqt_to_pdb.py script. Results for each binding modes are extracted from the log file and placed into the results CSV file. The log file and all the related pdb and pdbqt files are then compressed into a zip file. Folder selection windows may experience some initial lag when using on machines with Vista. SMILES files need to have a .smi extension in order to be detected as SMILES files. Will not work with MGL Tools 1.5.6rc3 because of folder change. A simple workaround is to create MGLToolsPckgs\AutoDockTools\Utilities24 under MGLTools 1.5.6rc3 and copy prepare_ligand4.py and pdbqt_to_pdb.py from Lib\site-packages\AutoDockTools\Utilities24 to it. Version 1.6 [18 Dec 2009]: Change the way that the ligand.pdb, stored in the zip file, is generated in order to facilitate RMSD calculations. Version 1.5 [04 Dec 2009]: Fixed bug which prevents the rest of the ligands from being processed if one ligand has an error during processing. Fixed bug with working with SMILES files. Added feature to automatically add csv extension to Results file if required. Version 1.4 [01 Dec 2009]: Reduce memory usage for large SDF, SMILES, PubChem ASN and PubChem XML files. Version 1.3 [29 Nov 2009]: Allow user to create a log file containing output from the various python scripts and AutoDock Vina. This is useful for debugging if errors occurs. Note that this log file is different from the log file that is mentioned under Technical Details. Version 1.2 [26 Nov 2009]: Allow user to copy and paste into property sheet. Version 1.1 [25 Nov 2009]: Allow user to use pdbqt files as ligand files. Change GUI to using property sheet. Version 1.0 [17 Nov 2009]: First release.